Children are a source of joy, and they can definitely bring a good mood to any house. They love to play around and mimic the things that their parents, aunts, uncles, grandparents, and siblings do. In fact, because of their curiosity, most of them love to take part in grown-up activities. At times, they even want to have an area wherein they can read, write, and play without them being disturbed by an adult. So, it is always better to provide them with a small activity area or living room that they can call their own. Providing them with a dedicated corner will also help them become more organized since they will feel the need to fix their own toys or things. This can also be a great way for parents to start training their kids to be responsible. However, you must consider the fact that you need to be practical when purchasing items for them since they grow fast. It does not really mean that you need to go too low on your budget, but you have to buy one that they can use before they attend school. In addition, since most apartments and small houses have limited rooms, some of you would have insufficient space where you can set up a space for your child. Fortunately, we have found a solution, and that is a sofa set which is specially designed for kids. With that in regard, if you are interested in having one, read on as we have just reviewed the Costzon Kids’ Sofa Set below. This furniture set for children comes in two pieces namely a two-seater sofa with armrests and an ottoman that can either be used as a footstool or chair. The cushion is made of soft sponge. The ottoman and full-sized couch setup included in this set are professionally made. They compliment each other perfectly, giving the children a comfortable and stylish corner. It comes in two colors which are white and black. Since they have subtle tones, they can easily match any type of interior design. They might not seem very lively and eye-catching, but they’re a nice break from every other product for kids that have childish designs. The materials used in building the units have been well thought off. The frame is made of sturdy wood, and the shiny, leather upholstery is resistant to stain. With small children and toddlers, the major concern of parents is having furniture that is full of chocolate smudges and spilled juice. Fortunately, the surface of this product can be cleaned by simply wiping it with a wet cloth, followed by a dry one. The ottoman and sofa are both lightweight so that both the parents and children can move the setup around the house without hassles. Also, you should not worry about your floor since the manufacturer assures that the PVC-made legs won’t scratch hardwood surfaces. With bigger and older children, some issues might pop up when it comes to using this product. First of all, the dimensions of the combo are just for children aged three to five. If, however, you have a small seven-year-old kid, then this might work. Secondly, while the build quality is good, heavier children might not be safe since it can only carry a maximum weight of 132 pounds. Nonetheless, if you want to add more to the setup once your budget and space permits, armchairs and smaller ottomans with the same design are available. Hence, with a bit of an extra fee, a whole tiny grown-up station can be built for your kids. When it comes to shopping for kid furniture, things get real tricky since there are a lot of brands that claim to be the best in the industry. Also, you have to consider not just your budget but also the comfort and the safety of the children. When it comes to safety, even the smallest detail is essential. Anything from a loose nail or screw to an unfinished piece of plywood can be a hazard to a small child. 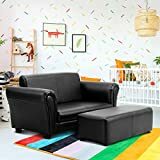 With that in mind, we searched the online and retail market for another children’s living room set to see how it would fare with the kid-friendly Costzon Kids Sofa Set. The KEET Roundy Child Size Chair also comes with a dual-purpose ottoman. In addition, it is also made of a durable wooden frame and cushioned well to provide both comfort and support. However, the chair can only hold a maximum weight of 100 pounds since it has a smaller size. That being said, this is more suitable for homes that have small space. Another critical drawback of this product is the synthetic microsuede fabric that has been used in the upholstery of the ottoman and chair. Although it is stain-resistant, it can absorb moisture and trap smell. We know that children are messy by nature and we cannot prevent them from spilling anything on the product. For us, there is no doubt that the Costzon Kids’ Sofa Set is the perfect gift for the hyperactive “shadow” who keeps following parents around the house each waking moment. It’s a great bargaining chip for any parent who is ready to give their kids what they want: a cute, false sense of adulthood and a place that’s only theirs. With this set-up and personal space, they can develop their creativity, organizational skills, and sense of responsibility.